Today’s post is about my visit to Bubba Gump Shrimp which is a brand new restaurant in London and is based on the movie Forrest Gump. Bubba Gump is a huge chain in America and the London one is the first one outside the US. The restaurant which is located near Leicester Square opened in October so obviously I was there within a couple of weeks. If you’ve been to the old Planet Hollywood a few years ago, you’ll know that upstairs is HUGE. On arrival, you walk into the gift shop where you are greeted by a server. We waited no more than five minutes before been took upstairs to be seated. We did end seated next to a window which was quite noisy due to construction, but they kindly moved us to a booth. They do some pretty damn good beverages in this place, the drinks menu is just as long as the food! Be warned that some of the drinks are slightly expensive as you get to keep the drink, so if that’s not your thing keep an eye out. I can’t remember what my drink was called but it was like Cherry Lemonade and it was SO good! 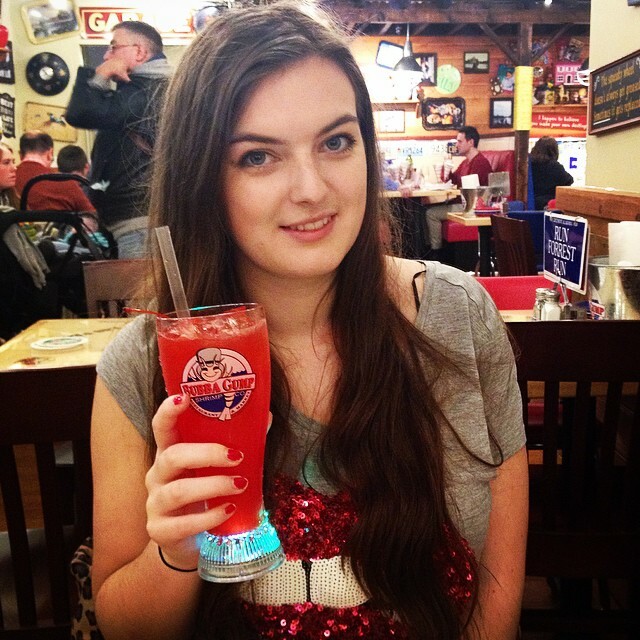 (Update: Bubba Gump tweeted to say it’s called Fizzy Fun!) I got a little flashing glass to take home too! The menu is obviously quite fishy, with lot’s of different options from shrimp platters, fish and chips but they also do a good burger. As a opening offer, we got a complimentary shrimp sharer for the table. The funny thing about going to Bubba Gump is that I’d never actually ate shrimp before so this was the perfect opportunity to try it! For main course, I ordered the Fish and Chips. It was such a large portion I couldn’t actually believe the amount of chips that came with it. The fish was lovely, although not as good as up north 😉 Alex ordered a cheeseburger with a side order of griddled onions which i stole. I totally recommend getting these on the side as they are yummy! My Mum got the beefburger also with griddled onions. The food overall was incredible but there was far too much for me to eat it all! The price point of the meals is around £12, which is reasonable for this sort of area and especially for the amount of food you get! We chose not to have dessert as we was well and truly stuffed. We spent the rest of our meal admiring the decor. It’d got some really cute unique pieces which make it such a fun place. I’m a big fan of Forrest Gump, it’s one of my favorite movies – The decor is full of movie memorabilia and the servers have a little trivia quiz for guests. Hope you enjoyed this post, I’ve been meaning to get it up for a month or so! If you are looking for some other delicious restaurant reviews, check out my Food Directory. Let me know if you are a fan of Forrest Gump or have been to Bubba Gump either in London or the US? Best Looks From The Golden Globes 2012. OMGOSH, this place looks amaaaaazing! I definitely want to go! Ah I went to the one in NYC earlier this year and loved the novelty of it all! Oh my! This place looks awesome! I am a big fan of the film so will definitely be visiting if I am ever in London! The food looks so tasty as well! Great post! I'm generally not a fan of themed restaurants but this looks a little less in your face, but I'm a vegetarian so I imagine their options for me would be limited sadly. Still, I might pay a visit. I love the idea that a place from the movie actually exists. It looks really gorgeous. omg wow i am so envious this is exactly a dream to go here, it loks so delicious!